for almost eternity. Why is that? Or am I alone in memories? with that flavor, it taste burnt. Will that taste ever go away? Sometimes I breathe in the scents of foods, and I remember - places, times, people, adventures. In many cases the taste or smell of a sweet, coffee, gravy or an entire meal is capable of painting a picture with richer, deeper brush strokes than any snapshot in the photo album. While I struggle to remember my mobile phone number or grapple helplessly to recall my closest of friends' names when I need to mail them or introduce them to someone, the merest sniff of brewing coffee is enough to flood back memories of two decades ago, from my Ajji’s kitchen with frightening clarity. Give me that same coffee in a small steel tumbler and I can recall the dark room where I sipped that coffee with my sister hiding under the cot as we kids were forbidden from drinking strong coffee, the colour of bangles on my Amma’s hand when she pulled us out with a half filled coffee glass in my hand and a fake anger on her face:) Such details more glowing than the coffee I had just one hour back!!! Food has also become a central way for me to socialise with others, to comfort my friends and family and even sometimes few strangers as food sure brings enormous pleasure and joy when shared with others. It has made me feel comfortable in new places, even some unknown places. And most importantly food had made me to remember the places I’ve lived and the people I’ve known in those places. One such food memory is something I loved when I lived in Bangalore. I lived in a hostel owned by a Sindhi couple and V aunty was a wonderful cook and baker. Her delicious Sindhi style Stuffed Capsicums/Peppers is something I missed dearly after I left Bangalore. It was not usual stuffed capsicum with potato filling or rice but it used grated onions lightly spiced with fresh green chillies and coriander. I had been looking for this Dhaas Shimla Mirch recipe since long time and at last I found it in Alka’s Sindhi Rasoi. One look at the photo and the list of ingredients and I knew I just hit the jackpot. I could hardly contain my excitement and straight away went into kitchen to try it right away. Although V aunty and Alka had used Green Bell Peppers I cooked with Mini/Baby Orange Bell Peppers I bought from Farmer’s Market which I knew would be sweeter than the green ones. With few modifications to Alka’s recipe, this platter of golden beauties was ready in few minutes. Dont be fooled by the short ingredient list and simplicity of these ingredients. The recipe is surprisingly simple and the end result is simply superb. It was bit sweet with a touch of spiciness from green chillies and tanginess from dry mango powder and it was everything I remembered. Thank you Alka. It’s because of your recipe I am finally over with my obsession of finding this recipe and this recipe has become our family favourite. 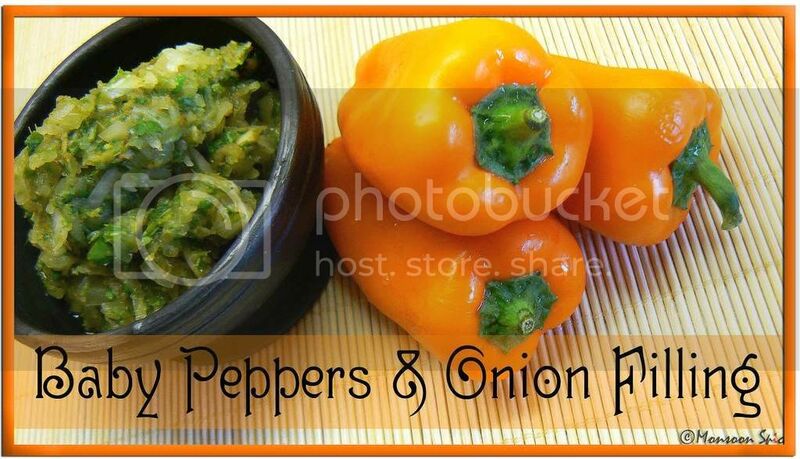 I will be making them soon with multi-coloured Baby Peppers and next time I might bake them and then grill instead of cooking on stove top to make it zero-oil cooking. This is my entry for Kayln's Weekend Herb Blogging event guest hosted by Astrid. Slit baby peppers on one side and remove its seeds and pith carefully without breaking it. If using large peppers, then slice off their top and remove its seeds and pith carefully. Grind coriander leaves, green chillies, garlic and ginger roughly without adding any water. Mix this ground paste with grated onion, all spice powders listed and salt to taste. Stuff this onion mixture into bell peppers carefully. Make sure that you don’t break bell peppers while stuffing by stuffing little filling at time. Heat oil in a deep pan. Carefully arrange bell peppers in a pan. Cover the lid and cook on a low to medium flame. Toss the bell peppers at regular intervals to make sure that they don’t burn and stick to the pan. Make sure that the bell peppers are cooked from all the side. On a whole, it took me around 15 minutes to cook these bell peppers on a very low to medium flame. 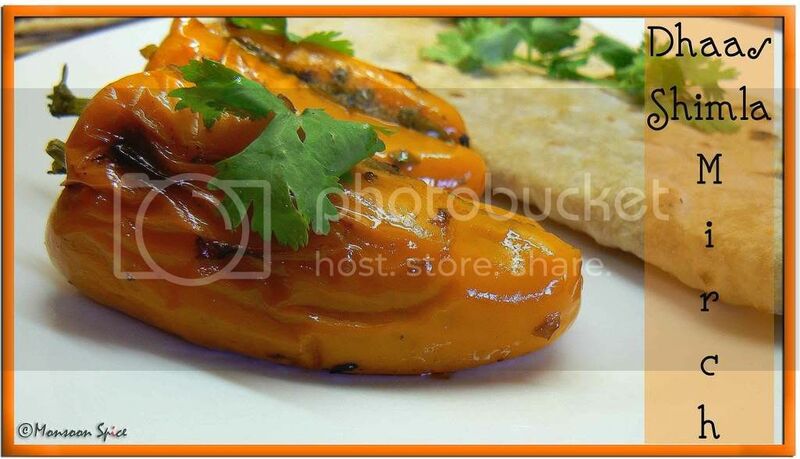 Serve this delicious Dhaas Shimla Mirch with Chapatti or Rice and enjoy. Next time I might sauté the filling for few minutes and then stuff the bell peppers and bake them in an oven for 5 minutes so that the bell peppers remain crunchy. And then grill these baked peppers for about 3 minutes to get smoky taste. 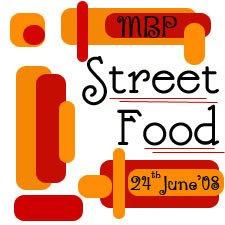 MBP-Street Food ends on 24th of June, 2008. Start patrolling the blogs and cook your favourite Street Food that your tummy begs and heart desires and spread link love. Please go through the guidelines and include all the required information in your post and mail when sending me your entry. Don't forget to add Your Name, Your Blog Name, Name of the Dish you cooked, Perm Link of the entry, Perm Link of original recipe along with the gorgeous Photo of final dish. They looks delicious, with such a delicious filled peppers you are making me drool. I am surprise it is just onions and spice inside them. That's indeed a great recipe, Sups! Thanks a ton for posting this lovely dish. Looks easy enough even for me. About the 256 cookies, the plan is to try most of those variations during summer break. Want me to send you some? kya kaise kaiseeeeeee kheechte ho woh pics.... too good..
delicious. lovely pics as usual. hey Sia amazing dish this is stuffed capsicum is always tasty and goes with almost everythng..
Oh those are beauties and with the stuffing just delicious I bet. those look great! :-) thanks so much - definitely going to try this. Different & quite simple ...new to me..will try ..
Love the photos, Sup! Like how you've slit the peppers from the side & not from the top. OMG.......It looks so delicious and appetizing! Wow, Sia you always amaze me with these lovely dishes you come up with..The pics are too good!! 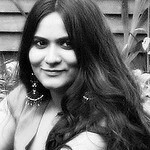 Hi sia...lovely blog...have enjoyed every bit of it. There's something for you on my blog...do chk out. this recipe has been bookmarked (im going low on bookmarking, i bookmark for each week and i make sure i try :) ) - will let you know results. Sounds so good, and I love the color of the peppers. looks nice. 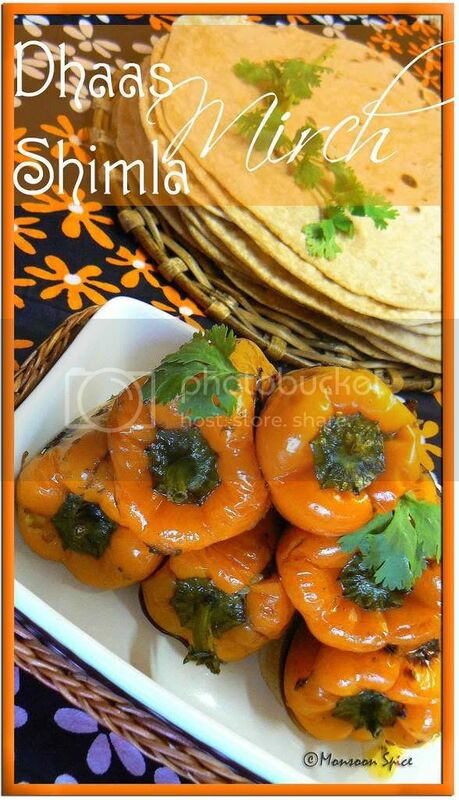 must be yummy with akki roti, bookmarked ..
More like 'Dhassu' simla mirch! yummmmm!